Within the process of life as a whole, and according to the Toltec teachings, the dark jewels provide the necessary friction that makes possible the evolution of awareness, and in this sense they are considered positive. Likewise, within the life of the individual, it is through the relationship between the light jewels and the dark jewels that our shadow side comes into being. 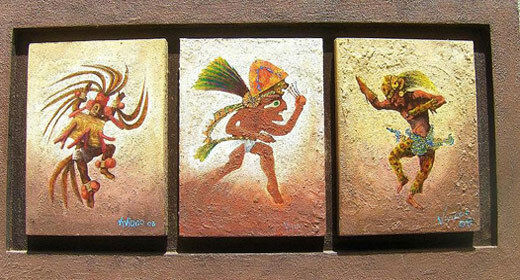 In terms of the Toltec teachings our shadows are our shortcomings, and our shortcomings are recognised as our ticket to freedom and our passage to power. Therefore, as individuals work with the dark jewels through their reflection; namely, the respective shortcomings, the dark jewels once again make the evolution of awareness possible. In this respect, it should be emphasised that true Toltecs never work directly with the dark jewels, but only with their resultant shortcomings. Many people are often confused about what constitutes a shortcoming as opposed to a behaviour pattern. Below is a list of the Dark Jewels and the Shortcomings that arise from each of them, as well as SOME of the possible behaviour patterns. In working with this list it will help you to realise that the Dark Jewel, Egotism (Jewel 22) is in every way a kernel or seed giving rise to all the other Dark Jewels. In other words, the Dark Jewels ripple out from Egotism in an ever-increasing degree of negativity, or life-destructive potential. The Dark Jewel Egotism has two polarities; namely Self-importance and Self-pity, which are the active and passive poles of this jewel. A similar relationship is mirrored through the rest of the Dark Jewels. In this respect, according to the Toltec teachings, the active pole should be regarded as what you inflict upon the world around you, and the passive pole as what you inflict upon yourself, or allow others to inflict upon you. However, it is wise to bear in mind that to define something is a double-edged sword. For the sake of clarity definitions are necessary, yet in defining something we have already made it less fine, or less pure; that is, less true. Therefore it is imperative that you do not become hooked to the actual words used, or see them in isolation to each other. Remember that, in relation to the Toltec teachings, words serve as a springboard (departure point) into the Unknown. If you do not adopt this approach the words will merely become a trap that will serve to enslave and distort your perception. This list will only serve you if it is seen as an interconnected continuum, meaning that every Dark Jewel, and every Shortcoming that arises from them, as well as the manifestations of these Shortcomings; that is, the Behaviours, are all thoroughly INTERRELATED, INTERACTIVE and therefore INTERDEPENDENT! In other words, Toltecs maintain that if you are being life-destructive in one area of your life, this will carry through to every other area of your life. We have listed below are only a few of the principal manifestations of each shortcoming, but it should be remembered that the possible behaviour patterns stemming from any particular shortcoming are truly endless, and the permutations are unquantifiable! Therefore use your hearts to guide you. Not to do so would render this list USE-LESS! Behaviour: Self-opinionated, arrogant, self-centred, pompous, holier-than-thou, longwinded. Behaviour: Victim/martyr, hard-done-by, unappreciated, fear of exposure, fear of being wrong, fear of criticism. Behaviour: Demanding, over-bearing, bossy, intimidating. Behaviour: Servile, seeking approval, grovelling, docile. Active Shortcoming: Obsession with having to control. Behaviour: Clinging, demanding, wanting to be right, worrying, being derogatory, volatile, defensive. Behaviour: Insecurity, avoidance, playing the Nothing Game, morbidity, indecisiveness, dishonesty, instability, timidity, lack of self-belief. Behaviour: Not listening, rebellious, closed, justifying. Behaviour: I will do it BUT under duress, having a chip on the shoulder, I will suffer but YOU will pay. Behaviour: Kindness of heart, putting someone on a pedestal, blind faith. Behaviour: Giving the benefit of the doubt, abnegating responsibility, do-gooder. Behaviour: Pig-headed, inflexible, dog-with-a-bone, aggressive, flippant, disrespectful, deflecting, defensive. Behaviour: Not listening, wanting life on own terms, insolence, unresponsive, stoicism, procrastination, denial. Abuse of Power – (Jewel 28). Behaviour: Imposing, insensitive, sadistic, vitriolic, aggressive, sarcastic. Behaviour: Callous, cold, unnurturing, harsh. Abuse Generally – (Jewel 29). Behaviour: Forceful, greedy, coercive, aggressive, playing the Blame Game. Behaviour: Infatuation, romance, fanaticism, narrow-mindedness. Behaviour: Sexual manipulation, covetousness, lewdness, hunger for power, love of intrigue. Behaviour: Easily seduced, fraudulent, degenerate, depraved, decadent, perverted. Behaviour: Dogmatic, disbelieving, intolerant, assumed understanding, selective perception. Behaviour: Discriminating against, harbouring preconceptions, distorting the truth, indulging. Behaviour: Anarchy, nihilism, discrediting, slandering, gossiping, interrupting. Behaviour: Apathy, indifference, carelessness, negligence, sloth, confusion, laziness.